Call to Action!! Support The War at Home Foundation! To support those in domestic violence shelters, we have gained a commitment from a retailer to donate food and clothing to shelters that we have affiliated ourselves with. Our eventual aim is to build safe havens/retreats throughout the world offering shelter to victims and support groups to survivors. To embark on an intensive awareness campaign through schools from January 2017, we have a commitment to do monthly campaigns from 12 schools, so far next year. We have developed a "KEEPING YOU SAFE KIT" which is a pack of vital items that someone will need when leaving an abusive situation, it also includes vital pointers on a safe plan for leaving. We are committed to raising awareness surrounding the court system and the pitfalls that a survivor will face and we are recruiting domestic violence advocates throughout the world who can lend a hand of support to those who are facing court issues and need a supportive hand. The only way we can fight the scourge of narcissistic abuse is through supporting those who are being forced back and through a consistent campaign of awareness and "red flag" identification. Please help us give those a voice who are voiceless. If you donate a minimum of ZAR 150, which is around US$10, you will be moving us forward to reach our objectives around and save lives. The website has been redesigned to make the donations easier as there was a problem last time we called for donations, nobody could donate, it's very self-explanatory, all you need to do is click on www.wahfoundation.co.za, them click on donate and the rest is easy...... the winner of the 500 US$ will be announced here and on the website on the 1 December 2016. It doesn't matter where you are in the world, we will ensure that you receive the prize. The thing about narcissists is that if they do it once they will do it again. You’ve probably been conditioned as the family event organizer since birth and every year the same scenario plays out. You are asked to prepare the holiday dinner and event and you do. There is also the added guilt that takes place when you protest doing all the work alone. Typically the narcissist will have a giant to-do list and needs “help”. The request for help is more of a demand and you find yourself checking off the items on this list alone. After all, the narcissist is so overwhelmed with all of the other things they need to do. 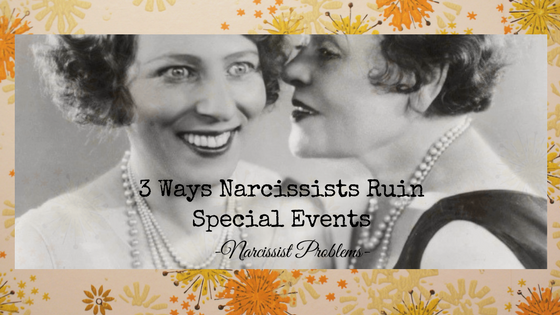 Spot narcissistic provocation and learn ways to prevent them. If you protest the narcissist, they will find some way to make you feel guilty and they will let everyone know about how you ruined the holidays if you quit the role of Santa’s little helper. Draw upon your past experience and create firm boundaries. You are an adult and you too have responsibilities to take care of. Refuse to do any work on this event if you are doing it alone. Trying to explain your feelings about the situation to the narcissist is pointless. Create a plan of action and tell the narcissist what they are expected to do and if they don’t do it then it will not get done. Be clear, firm, and stand your ground. Don’t let the narcissist manipulate you into doing their work by sending you on a guilt trip. Narcissists will pick apart your flaws and then point them out to others. If you have stress induced acne the narcissist will wait until the room is full and then proceed to point out each blemish to the guests. They simply thought that everyone grew out of acne once they matured out of puberty and here you are in middle age with pimples. You really need to get it together because something is wrong with you! If you are forced to interact with this person then the worst thing you could do is react. When a narcissist is picking apart your flaws what they are really trying to do is elicit a reaction. They don’t care if it is good or bad. If you are not giving them positive attention they will be happy to see you cry and get angry. Do not allow them this control over you. Be as solid as a rock and without any emotional reaction simply state that their behavior is inappropriate and then walk away. Disengage and refuse to be provoked by them. Chances are if they are making you feel uncomfortable they are also making others feel uncomfortable. Be a rock and walk away. Something about gossip and badmouthing really keeps most narcissists going. Just like cars need gas narcissists need gossip. They are constantly criticizing others and sharing intimate details or something made up in order to make you look bad. Narcissists use gossip as a means to triangulate people and put wedges in relationships. They want to be the focal point of every relationship. Narcissists don’t want people talking to each other because they need people to go through them as a means of communication. Narcissists use gossip as a tool to get what they want out of everyone around them and they do this by creating miscommunication among others. Understand that you can’t control gossip but you can control how you react to it and who you allow in your life. Narcissists recruit others to gain information about you so take stock of the relationships you have with anyone that has to do with your narcissist. If you see someone in your life that you confide in with the narcissist and they are alone and whispering. Chances are the narcissist is getting or giving the dirt on their target. If there isn’t any dirt to get then they will just make it up. Sever ties with narcissists and their flying monkeys. There is no winning this game and chances are that gossip will later be used to destroy your life. If you are struggling with going No Contact with an abusive family member you can find very useful information at the Sanctuary for the abused blog. There are a few sources that share great information and resources for those suffering from the narcissistic family member. The Narcissist’s Child is a blog geared toward daughters of Narcissistic Mothers and has a list of other resources such as relevant websites, blogs, and books. The Naked Narcissist and The War At Home which has recently started a nonprofit foundation to highlight Narcissistic Abuse and become a source of help to victims of narcissistic abusers.